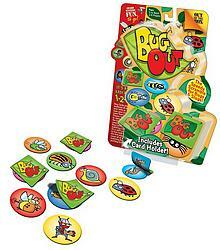 Bug Cards are scattered all over your table or even your living room floor! Players race to capture the bugs by covering each Bug Card with a matching Leaf Card. It’s a wild scramble to find each bug! Be the first player to cover all of your matching Bug Cards and Bug Out!